In a poem about his mother, Syrian poet Usama Halak writes, “Whose eyes were like the surface / of a quiet sea // Whose words were like pure water . . .” Currently displayed in the Travelling Stanzas exhibit at Summit Artspace, this poem is one of many that celebrates the voices of the refugee and immigrant populations around Akron. “There is something that’s very powerful about the ability of poems to make us feel empathy and to make us feel a connection with each other,” says David Hassler, Wick Poetry Center director. Mentors have been working with refugees and immigrants through Akron Urban Vision and the International Institute of Akron for roughly two years. Through workshops and weekly classes, instructors have been able to help newcomers feel more connected to the city of Akron. Writing poems has also helped with language barriers that English language learners oftentimes face. One teacher, Sony Ton-Aime, worked with middle schoolers at Urban Vision. Sony is from Haiti, but he came to the United States to study at Kent State University. 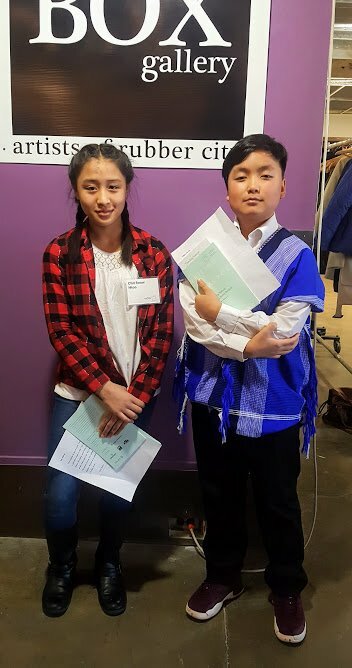 At the opening reception party at Summit Artspace, Saint Anthony of Padua Parish and School students Chit Snow Htoo and Ya Too read their poems to a crowd of over 200 people. Chit is originally from Thailand and has lived in Akron for about 10 years. 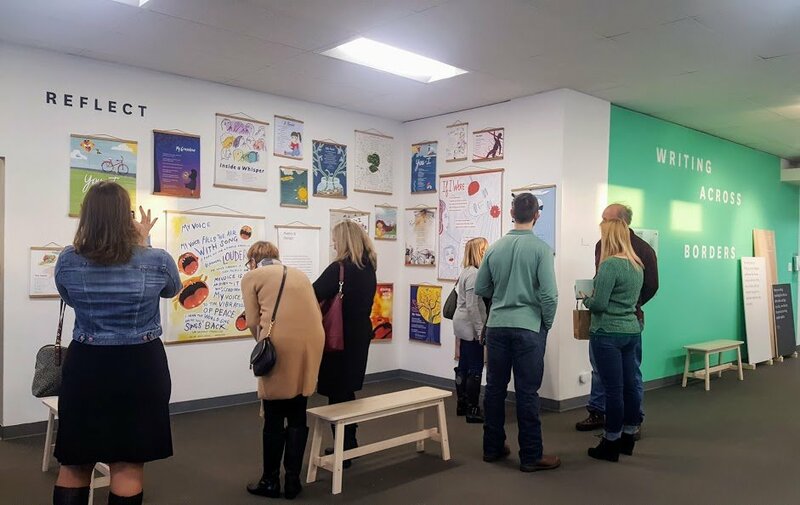 The exhibit at Summit Artspace is open through February 17. The exhibit is made possible by a grant from the John S. and James L. Knight Foundation. It features large postcards designed by students from Kent State University’s School of Visual Communication Design. The students work at local design studio Each + Every. 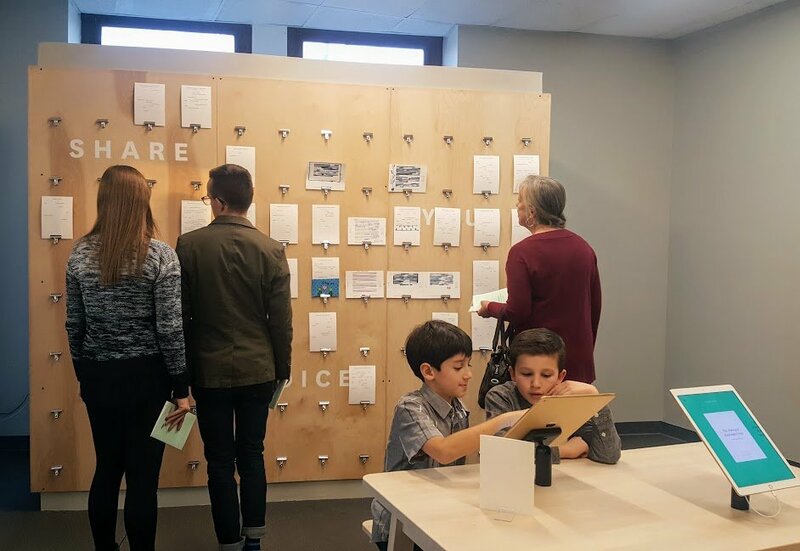 The exhibit also has two interactive tools named Thread and Emerge which invite people to participate in found poetry using texts related to the Akron community. Both tools will be used to create a unique poem that encapsulates the voice of Akron. “I think poems have that sort of magic, like all literature has a magical feature in its language that can carry one person’s story and plant it in another person’s mind and heart,” David says. To view the exhibit, visit Summit Artspace at 140 E Market St. Visit travelingstanzas.com for more information on the exhibit.